Lecture note is on the web Handout (6 slides/page) http://highenergy.phys.ttu.edu/~slee/1408/ *** Class attendance is strongly encouraged and will be taken randomly. Also it will be used for extra credits. 8-1 Conservative and Nonconservative Forces A force is conservative if: the work done by the force on an object moving from one point to another depends only on the initial and final positions of the object, and is independent of the particular path taken. Example: gravity. Object of mass m: (a) falls a height h vertically; (b) is raised along an arbitrary two-dimensional path. A person exerts an upward force Fext = mg to lift a brick from y1 to y2 . where k is called the spring constant, and needs to be measured for each spring. A spring (a) can store energy (elastic potential energy) when compressed (b), which can be used to do work when released (c) and (d). •! Also, W = F!r = mgyb – mgya = !Kbook •! mgyb – mgya = -(Uf - Ui) = -!Ug •! So, !K = -!Ug => !K + !Ug = 0 "
8-3 Mechanical Energy and Its Conservation If there are no nonconservative forces, the sum of the changes in the kinetic energy and in the potential energy is zero—the kinetic and potential energy changes are equal but opposite in sign. 8-4 Problem Solving Using Conservation of Mechanical Energy If the original height of the rock is y1 = h = 3.0 m, calculate the rock’s speed when it has fallen to 1.0 m above the ground. 8-4 Problem Solving Using Conservation of Mechanical Energy Assuming the height of the hill is 40 m, and the roller-coaster car starts from rest at the top, calculate (b) at what height it will have half this speed. Take y = 0 at the bottom of the hill. The rock’s potential energy changes to kinetic energy as it falls. Note bar graphs representing potential energy U and kinetic energy K for the three different positions. 8-4 Problem Solving Using Conservation of Mechanical Energy Estimate the kinetic energy and the speed required for a 70-kg pole vaulter to just pass over a bar 5.0 m high. Assume the vaulter’s center of mass is initially 0.90 m off the ground and reaches its maximum height at the level of the bar itself. A dart of mass 0.100 kg is pressed against the spring of a toy dart gun. The spring (with spring constant k = 250 N/m and ignorable mass) is compressed 6.0 cm and released. If the dart detaches from the spring when the spring reaches its natural length (x = 0), what speed does the dart acquire? 8-4 Problem Solving Using Conservation of Mechanical Energy Example 8-8: Two kinds of potential energy A ball of mass m = 2.60 kg, starting from rest, falls a vertical distance h = 55.0 cm before striking a vertical coiled spring, which it compresses an amount Y = 15.0 cm. 8-4 Problem Solving Using Conservation of Mechanical Energy A dart of mass 0.100 kg is pressed against the spring of a toy dart gun. The spring (with spring constant k = 250 N/m and ignorable mass) is compressed 6.0 cm and released. If the dart detaches from the spring when the spring reaches its natural length (x = 0), what speed does the dart acquire? A re-look at some problems Let’s say that we want to know the velocity of a block sliding on a frictionless inclined plane after it has slid down from a height h.
Determine the spring constant. Assume the spring has negligible mass, and ignore air resistance. Using Energy Conservation Let’s say that we want to know the velocity of a block sliding on a frictionless inclined plane after it has slid down from a height h.
Here the acceleration down the plane is continually changing since the angle of plane with the horizontal changes. Total Energy is same everywhere. 8-5 The Law of Conservation of Energy The law of conservation of energy is one of the most important principles in physics. The total energy is neither increased nor decreased in any process. Energy can be transformed from one form to another, and transferred from one object to another, but the total amount remains constant. 8-6 Energy Conservation with Dissipative Forces: Solving Problems Determine the thermal energy produced and estimate the average friction force (assume it is roughly constant) on the car, whose mass is 1000 kg. 8-6 Energy Conservation with Dissipative Forces: Solving Problems Example: Friction on the roller-coaster car. The roller-coaster car shown reaches a vertical height of only 25 m on the second hill before coming to a momentary stop. It traveled a total distance of 400 m. Determine the thermal energy produced and estimate the average friction force (assume it is roughly constant) on the car, whose mass is 1000 kg. 8-6 Energy Conservation with Dissipative Forces: Solving Problems Example: Friction with a spring. A block of mass m sliding along a rough horizontal surface is traveling at a speed v0 when it strikes a massless spring headon and compresses the spring a maximum distance X. If the spring has stiffness constant k, determine the coefficient of kinetic friction between block and surface. Because of friction, a roller-coaster car does not reach the original height on the second hill. The difference in the initial and final energies is the thermal energy produced, 147000 J. This is equal to the average frictional force multiplied by the distance traveled, so the average force is 370 N.
Arbitrary path of particle of mass m moving from point 1 to point 2. 8-7 Gravitational Potential Energy and Escape Velocity Example: Package dropped from high-speed rocket. A box of empty film canisters is allowed to fall from a rocket traveling outward from Earth at a speed of 1800 m/s when 1600 km above the Earth’s surface. The package eventually falls to the Earth. Estimate its speed just before impact. Ignore air resistance. 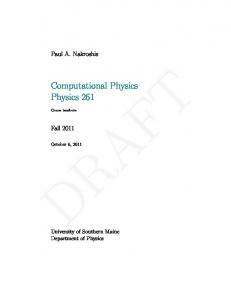 Report "Physics Principles of Physics"